Bunions are an extremely uncomfortable and potentially painful foot disorder that is also known as hallux valgus. Bunions are formed by the bone or tissue at the joint of the big toe moving out of place which can be caused by a number of factors including genetics. Use the links above to jump ahead. We also offer a guide on the causes of bunions and how they are treated. 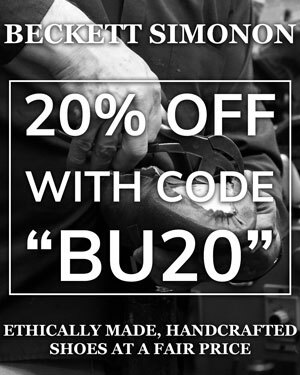 In a hurry and want to quickly pick up a good pair of shoes? Use the quick buy guide below to go straight to the retailers. Otherwise, scroll down to see all the shoes in detail. 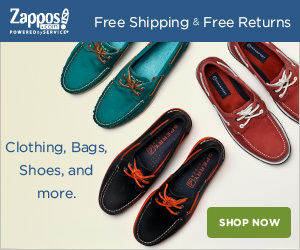 What Are The Best Men’s Shoes For Bunions? Although traditional shoes, Allen Edmonds is a heritage American brand that offers extremely comfortable premium shoes. These Oxfords are stunning and Allen Edmonds offers a whole range of shoe widths, which is quite rare. This should give you ample room to manoeuvre in order to provide the space needed for your toes. A business professional classic, Oxfords are an elegant choice to pair with a suit. 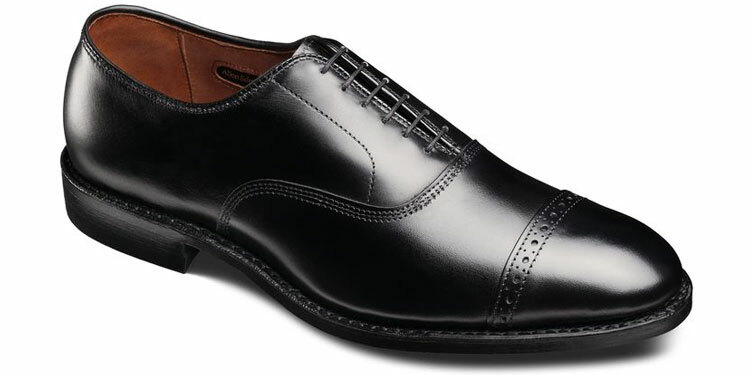 Furthermore, these Oxfords feature a subtle touch of perfing along the toe cap that make them truly stand out. You could even wear them with cocktail and evening attire. Although also available in brown, we’d favour the black as an ideal colour for these shoes. 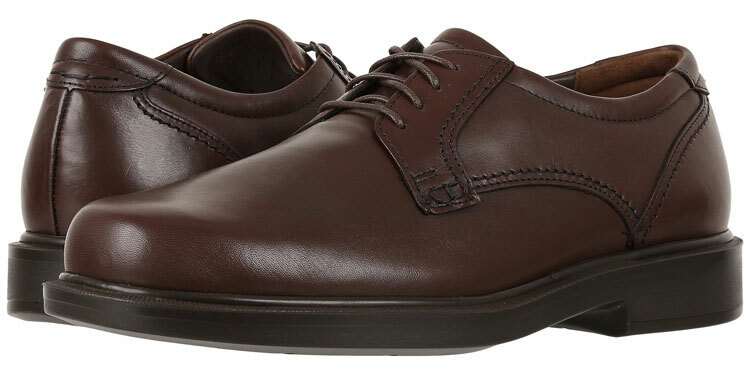 Brown is a rather casual leather colour for Oxfords and may be less useful for your wardrobe. If you’re in need of a superior level of comfort, sneakers might be your best bet. With a large toe box and deep heel and cushioning, these will keep your bunion at bay. Furthermore, the external heel counter will ensure that your stride is corrected and prevent your feet from sliding down the shoe. If you follow a profession that allows for sneakers, these are a good bet since they’re available in black. However, they’ll be difficult to wear in other circumstances aside from sporting activities. As mentioned above, the black shoes with grey accents are ideal for the workplace. Nevertheless, there’s also a grey option that’s worth opting for if you want something with a slight pop of colour. 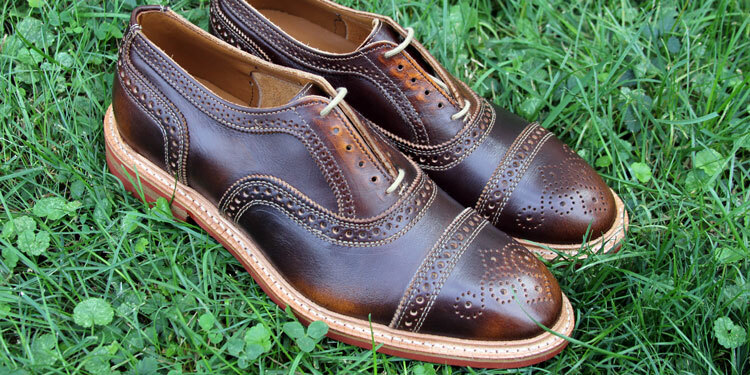 Like the Oxfords above, these absolutely stunning brogues are from the prestigious Allen Edmonds brand. They’re robust, cushioned for comfort, and will endure a lifetime. Furthermore, the last used to make these shoes features a comfortable toe box for bunions with plenty of widths available if you need them. Although more casual than the Oxfords, these stylish brogues are still quite dressy. Nevertheless, you can wear them for just about any dress code apart from particularly formal events. Whether you’re wearing jeans, chinos or a three piece suit, they look absolutely stunning. Despite only being available in brown, they feature a palette of colours, which is what makes them versatile. With a vintage-style brown leather, tan welt and rust red soles, they can be seamlessly introduced into a colourful wardrobe selection. Boots may be difficult to wear with bunions. However, these chukkas were specially designed by Vionics with orthotics in mind. Therefore, they’re very comfortable and feature ample room in the toe box. Furthermore, a removable EVA footbed designed by podiatrists ensures superior comfort and fit. Although largely a casual boot, you could happily wear these for business casual attire too. Whether you prefer dressing down in jeans and a hoodie or want to throw on a sport jacket, they look great and are very inconspicuous orthotic shoes. We strongly prefer the water-resistant tan leather. However, they’re also available in black. That said, the black leather is a little to dressy given the shoe style whereas the tan will be easy to introduce into your wardrobe. 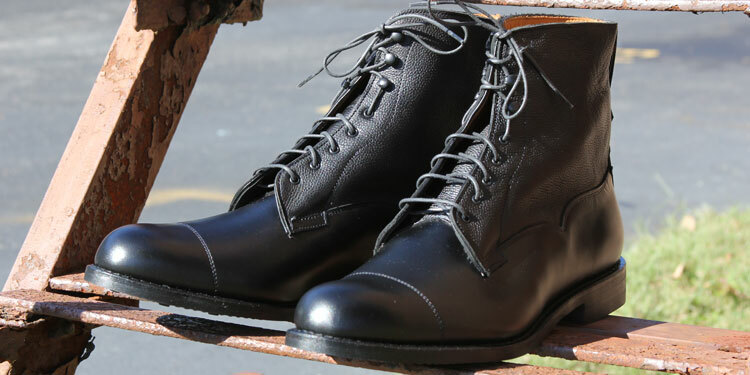 For a dressier and much more stylish boot, Allen Edmonds have created some marvels. One of which is the Sullivan Street, which is a comfortable and classy boot indeed. Made with a comfortable cushioning and Dainite soles, they’re also available in several widths to cater for your bunion. A combination of full-grain calfskin and pebbled leather in the quarters and uppers add extra visual interest to these beautiful boots. Their complexity makes them ideal for anything ranging from casual attire to cocktail dress. Available in both brown and black, you can choose the colour according to your needs. If you prefer something a little more casual, opt for the brown. However, we’re quite fond of the black thanks to the toe cap. 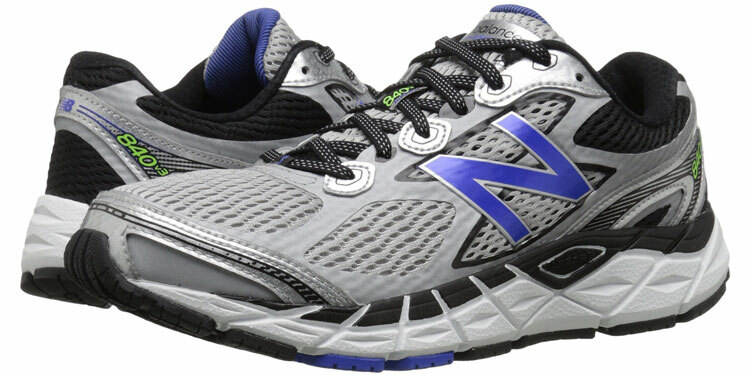 Whether you’re looking to go on walks or just want a sneaker offering superior comfort, the New Balance 840 V3 is a wonderful option. The Abzorb midsole offers blend foam cushioning and compression for extra support and stability, which also prevents your feet sliding down the shoes. These are pedigree athletic shoes and therefore quite hard to integrate in a casual wardrobe. As athletic shoes, they’re ideal. However, you’ll not be able to wear them with anything more formal than jeans unless your profession allows or requires sneakers. There are only two options available for these shoes. If you’re wearing them professionally, we’d suggest the black option. Otherwise, the grey with blue accents features a splash of colour. If you suffer from more severe bunions, then you may require an orthotic shoe. Fortunately, these Derbies by SAS offer removable SAS Tripad cushions, which support your pressure points. Furthermore, there’s a wide toe box and the Everbounce removable PU footbed carefully holds the contours of your feet. As orthotic shoes go, the SAS Ambassadors are quite versatile. They’re ideal for both nights out as well as the office. As such, they can be paired with a regular business suit or even chinos and an open-collar shirt. Derbies are better associated with brown leather. Therefore, if your needs are more casual, we’d suggest this. However, if you want to wear them for work, there’s a black leather option too. Similar to the SAS Ambassadors above, the Bikefronts are best reserved for more acute bunions sufferers. 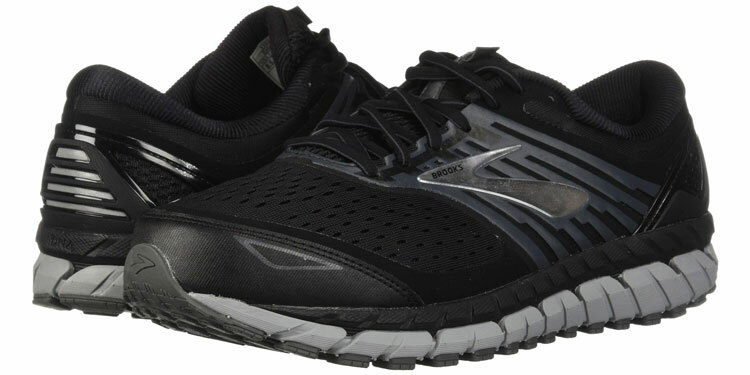 They offer similar features but with a much larger toe box to offer pain relief with a reasonably dressy style. Being chunkier with an unusual stitching design, the Bikefronts are more noticeable as orthopaedic shoes. However, they’re perfectly acceptable from any formality above business casual. You can wear these with a blazer or even a suit and tie. 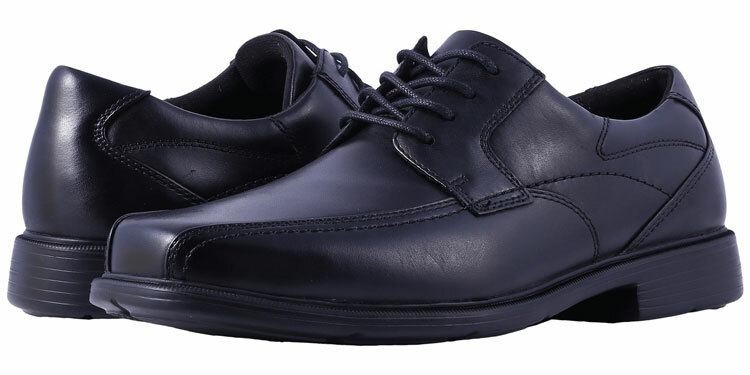 The Dunham Douglas Bikefront shoes are only available in black. However, that does not mean that you can’t wear them stylishly. Consider pairing them with chinos or even a business professional suit. 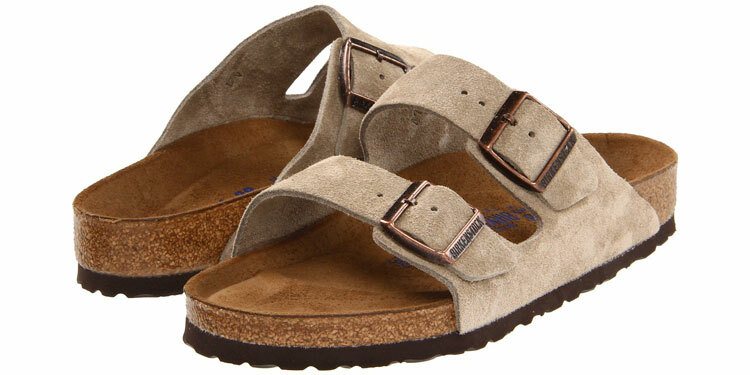 A classic brand known for providing comfortable sandals, Birkenstocks are a great choice when suffering from bunions. The contoured footbed moulds to your foot shape, which provides a customised cushion for comfort throughout the day. Birkenstock sandals are perfect for either a day out on the beach or simply chilling out in the garden. Whatever scenario you choose, these casual shoes are ideal companions. Depending on your personal preference, you can opt for either grey, black or even tan suede leather. 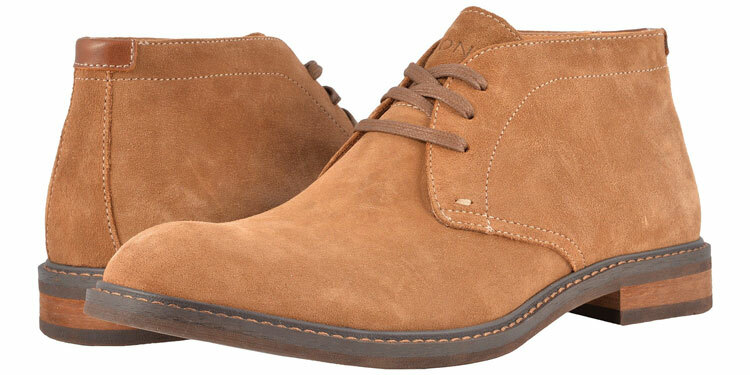 We’re quite fond of the tan as they’re a casual style of shoe and black is potentially too dressy. 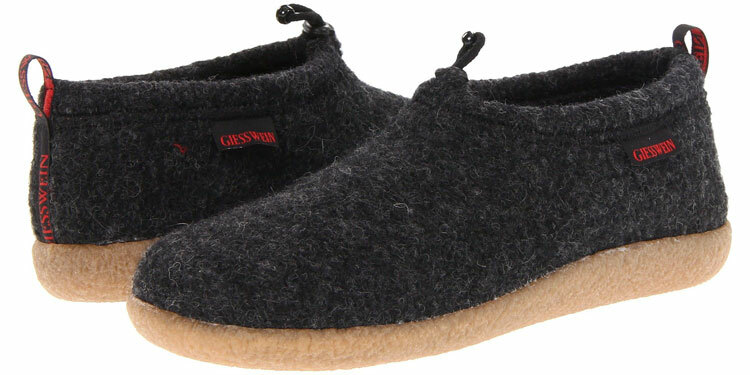 If you’re looking for comfortable slippers that provide you cushioning and warmth in the winter, these breathable shoes by Giesszein are perfect. Made from natural wool, they’re also ideal for the entire year whilst the cushioned footbed provides arch support. Being shoes for around the house, you can wear these with pretty much anything you want. Whether you’re in pyjamas, a dressing gown or even fully-clothed, you can be assured comfort thanks to these slippers. There’s a whole spectrum of colours to go for depending on what you prefer. From red or blue as well as lime green or purple, pick out something that makes you feel good. Hallux Valgus is best best known as a bunion, which is a growth or enlargement of the inside area of the joint at the base of the big toe. However, this bony lump is actually due to a misalignment of the big toe joint, which may develop with additional bone formation. Over time, this misalignment may increase, which causes the big toe to point towards the smaller toe. Whilst not everyone experiences other symptoms, the abnormal pressure can be quite painful. People suffering from bunions can experience swelling, redness and deep joint pain similar to arthritis. Other symptoms include blisters as calluses due to repeated friction on the growth due to ill-fitting shoes. In fact, a poor shoe fit can cause a bunion to degrade as well as bring about severe soreness and pain. 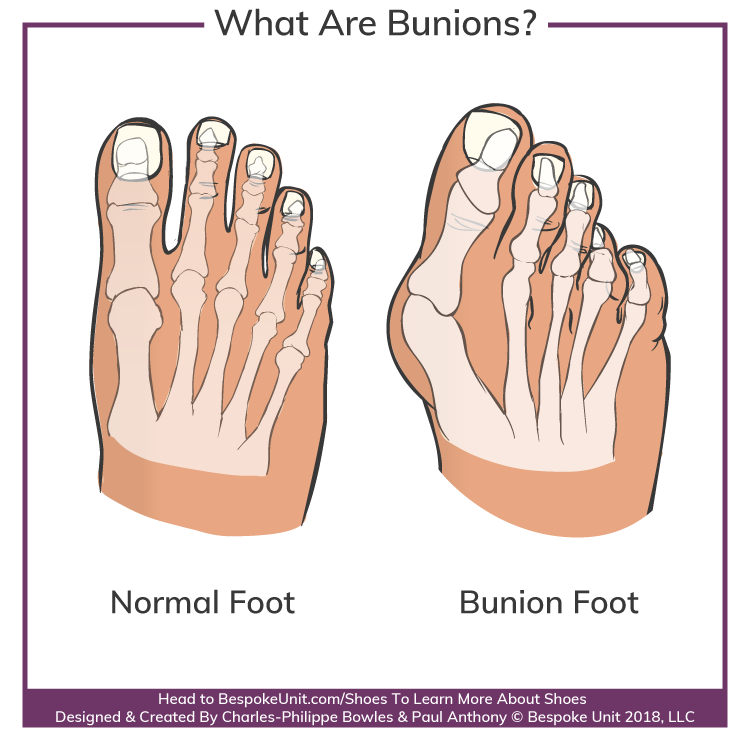 Not all bunions happen on the big toe and a rarer condition is where it is experienced on the small toe, which is known as a tailor’s bunion or bunionette. A number of factors can contribute to the development of bunions. However, the true cause is not entirely known. However, it is agreed that bunions may be genetic and can run in the family. Nevertheless, a leader factor is that the foot is exposed prolonged and abnormal pressure and positions, which has an adverse-effect on the joint’s mechanics. For instance, people with flat feet are prone to developing arches as they tend to overpronate. Similarly, ill-fitting and uncomfortable shoes may put undue strain on feet whilst injuries such as sprains and fractures can also eventually lead to bunions. As women are more prone to bunions than men, it is also widely believed that stilettos and high heels may be a common cause. As mentioned above, feet that are exposed to abnormal pressure and positions are likely to develop bunions over time. Depending on the severity of the bunion, there are a number of conservative and surgical treatments available. However, the need for surgical intervention may increase as the deformity becomes more severe. One of the best and easiest ways to treat bunions and experience some pain relief is by wearing wider shoes. This reduces pressure on the growth and lessens the pain experienced from friction. Wide Toe Box: Gives room for the bunion and reduces pressure and friction. Low & Deep Heel: Securely holds the heel and prevents the feet sliding towards the toe box. Arch Support: The right arch support ensures a natural position for the foot. Cushioning: Shock absorption reduces pain when walking. Whilst regular shoes may be suitable for milder cases, severe bunions may need specialised orthotic shoes or inserts, which provide superior cushioning. Ice packs are another anti-inflammatory approach, which reduces swelling as well as massages and warm seaks. Other non-surgical treatments include anti-inflammatory medication and the use of bunion pads to reduce pressure inside shoes. Furthermore, specialised splints can be used to correct the toe’s position. Some types can be worn inside the shoe whilst others are worn at night when sleeping. If the bunion continues to grow and affects the other toes or the pain becomes too overwhelming or persistant, surgical intervention may be necessary into order to correct it. This operation is known as bunionectomy and involves removing the growth and realigning the joint. Surgery is often successful but can fail due to the big toe moving back to the original position and redeveloping a growth. However, it usually succeeds in corrects the deformity and improves the function of the foot. Recovery from a bunionectomy can take a while and you’ll be required to stay off your feet for the first two weeks. Surgeons also suggest that you should avoid driving for 6 to 8 weeks and refrain from sporting activities for up to 6 months. Finally, the shoes above may also serve useful even after surgery. Other toes will likely be weak or stiff afterwards and not perfectly straight. Similarly, your feet might still be on the wide side and you may need to continue wearing comfortable or orthotic shoes for some time afterwards. Reviewed by Paul A., on 19th November . "Considerable pain relief. Thanks to this guide, I could walk normally again."